CLEAR & REST & STABILIZE YOUR MIND ! OPEN TO EVERYONE. Free of charge. Mind Training: Sojong and Lojong Weekend Sessions with Khenpo Pema Wangdak (over two separate days). Come anytime. This will be group practice sessions for beginners and ongoing students alike. The schedule will consist of alternating periods of teachings, practice, and guided meditations, as well as question and answer times. SCHEDULE BELOW—-You may drop by at any time. HERE ARE THE TOPICS of the teachings. They are open to everyone. THIS INFORMATION IS DIRECTLY FROM KHENPO PEMA. ignored, and misunderstood even by those who aspire to live by them. a solid foundation of patience. The talk includes discussion, meditation on the subject of patience, and question-and-answer session. nurtured by joy of life and equanimity of the mind. periods of teachings, practice, and guided meditations. to attend this weekend meeting. In 1982, he was sent to the West by His Holiness the 41st Sakya Trizin, as the first of the younger generation of Tibetan teachers in America from the Sakya School. In 1989 Khenpo Pema founded the Vikramasila Foundation. The Foundation encompasses the Palden Sakya Centers in New York City, Woodstock, NY, Philmont, NY, Englewood, NJ, Springfield, VT, Portland, ME, and Dayton OH. The Palden Sakya Centers offer courses in Tibetan Buddhist studies and meditation. 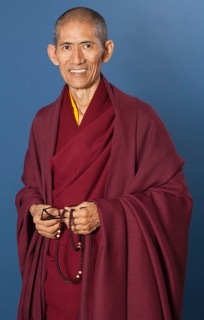 Khenpo Pema is the creator of “Bur Yig”–Tibetan Braille, and the founder of Pema Ts’al (English for Lotus Grove) Schools in Mundgod, India (for Tibetan lay children); Pokhara, Nepal (monastic schools for boys); and Pema Ts’al School in New York City, with a curriculum modeled on that of Sakya College, India. Khenpo Pema was recognized with the title of “Khenpo” by His Holinessthe 41st Sakya Trizin in 2007. He received the distinguished “Ellis Island Medal of Honor” award by the National Ethical Coalition of Organizations in May, 2009 at Ellis Island for his humanitarian work around the world. Khenpo Pema is the first Tibetan ever to have received such an award. Khenpo Pema has been guiding Western students for 35 years, and he continues to travel and teach extensively to Dharma centers around the world.